Based on a true story set during World War II, this is the tale of how four brothers in Belarus stood up against the might of the Nazi army. After losing most of their family in a German massacre, four Jewish brothers set up home in the woods. Soon they are joined by other Jews, and decide not to turn any applicants away. Their band soon grows to over 1000, which provides both opportunities and challenges: opportunity to strike back, and challenges to remain free and well fed. 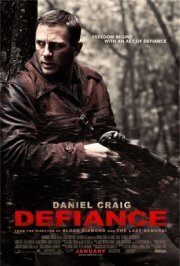 Disputes amongst the brothers lead to one leaving to join the Russian army, while the rest try to stay alive until the end of the war.